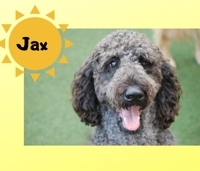 Jax, a 3 year old Labradoodle, has been attending our daycare groups since he was a puppy. One of his favorite activities is running around with his friends on beautiful spring days. Jax always looks forward to being greeted by his two legged friends with head and back scratches! Since 2008, Canine Adventure, LLC has been providing quality dog daycare for large and small breeds. With over 25 years combined animal experience we know what dogs really want. They want to have fun socializing in a safe, caring, and enriching environment. Dog daycare at Canine Adventure, LLC provides your pup with the additional mental stimulation and excercise they need which a lonely day at home does not. Proper excercise and stimulation curb unwanted behaviors at home. At Canine Adventure, dogs spend the day interacting off-leash in a safe environment with other pups of similar size and caring people. When you pick your pup up in the evening, they will be ready to relax with you at home after a day of fun. Copyright ® 2011. Canine Adventure, LLC. All Rights Reserved.